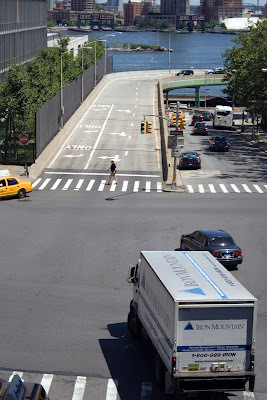 This is shot from Tudor City Place looking down on 42nd Street as it ends in ramps leading on and off FDR Drive. And doesn't the East River look lovely today? Remember at the beginning of this walk I said I was meeting FL for lunch? This is the place. Convivio. Pretty fancy for two out-of-work gals, you say? I'll explain. This lunch took place during Restaurant Week in New York. Actually, finding that link, I just discovered it's still going on. Through this week. Anyway, as many of you know, you can get a special lunch at many of the city's best restaurants for $24.07 (that odd price is to point out that New York is open 24/7) and the way to do it is find the most expensive restaurant with the highest food ratings and call as soon as you can because everyone else is doing the same thing. We picked a winner this year and now we want to go back. We crave it. That's the problem. This is what I had: First course, salad with figs and pancetta, but the pancetta was cut into thick logs. Wow. Main course: orecchiette with plum tomatoes and maybe ricotta, can't remember. This sounds dull but it most definitely was not. The pasta was silky and tender and the sauce was full of flavor. Dessert: Some kind of tart with chocolate ganache and caramel, which I was thinking about for the next week or so. Truly delicious lunch. Don't ask me what FL had – that was two weeks ago and I can't remember. Now with tax and tip the bill comes to a little over $30 and you might be thinking that's not really a cheap lunch and you would be right. I'm not going to tell you what it costs when you add a couple of glasses of wine. This is what you do about that. Book the latest lunch they serve and stay as long as they'll let you and then call it dinner. And my pedicure. Remember my pedicure? Right down the block. It was a nice day. 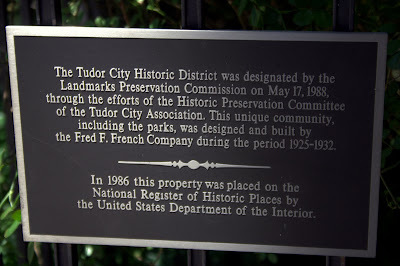 Tudor City is a large apartment complex, "a city within a city", according to its builder, Fred French, who built it in the late 20s in an area formerly filled with slums and slaughterhouses. Its boundaries are from 40th to 43rd Streets and Second Avenue to First which means that we've been in Tudor City since I crossed Second Avenue a few nights ago. In this Wikipedia article I learned that it was built on a bluff! There's my answer! (The question was why does 43rd Street overlook First Avenue.) 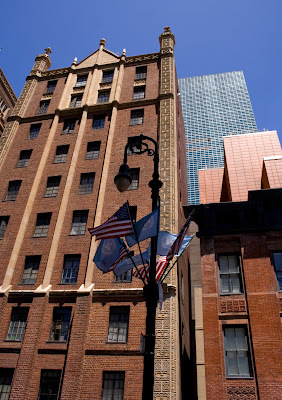 And the reason 42nd Street goes under Tudor City is that the cliff was cut through in the late 19th Century. I can't wait to walk on First Avenue on the other side. Since 43rd and 41st Streets dead end here and 42nd Street goes under, it is very peaceful. The first time I was here, several years ago, it was on my lunch hour, and I was just walking across 42nd Street, getting some more streets for my project (pre-blog). Suddenly I came across a set of stairs right there on the sidewalk, so up I went. It was like climbing a bean stalk and finding myself in another world. It was magical. If you go, I recommend you go up the stairs. You won't get the same effect walking there on 41st or 43rd. 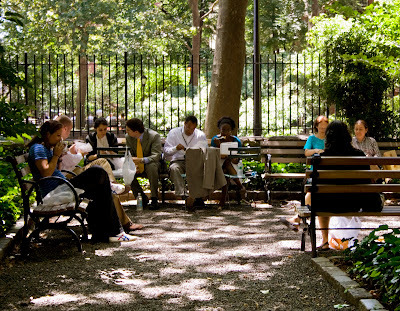 This is one of two parks in Tudor City. Since I was there at lunch time, there were a fair number of people in the park, but I'm guessing you could find some solitude at other times of day. This photograph of the Secretariat of the United Nations was taken at the end of 43rd Street overlooking First Avenue. 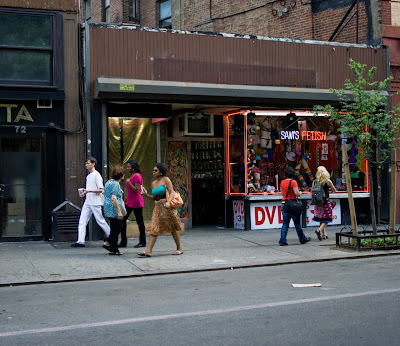 Did 43rd Street always overlook First Avenue? I tried to find out, but couldn't. Hard to google it. 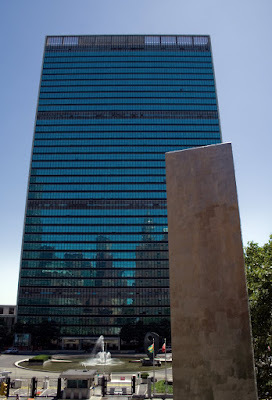 I'll have more to say about the United Nations when I walk First Avenue, but for now, just know that the buildings were completed in 1950, that the Secretariat was New York's first glass curtain building and that it was designed by Corbusier. Here's the entire building for all you completists out there. P.S. Tonight I realized I'm in a new neighborhood: Turtle Bay. I'll have more on the neighborhood in the next day or two and I also have to go back and do some relabeling. Work, work, work! 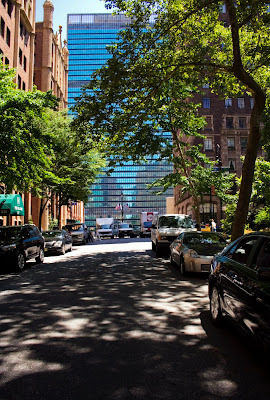 This is just a quiet tree-lined street in Manhattan. With the United Nations building at one end. 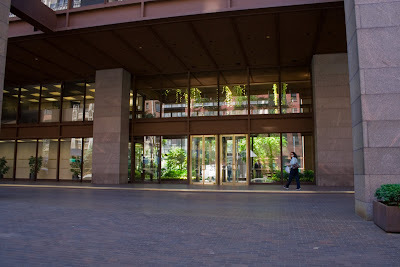 This is the entrance to the Ford Foundation building. And this is the atrium inside which is open to the public during office hours. The guard agreed it was a wonderful working environment. Galinsky has information about the building. 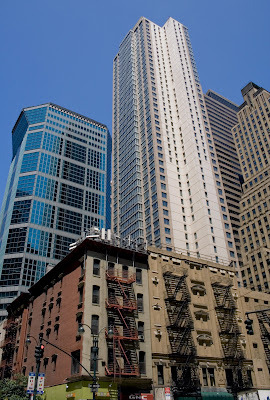 Continuing across 43rd Street, I was struck by this tall building with the open top. What was it for? Next, at street level, even more striking and raising more questions. 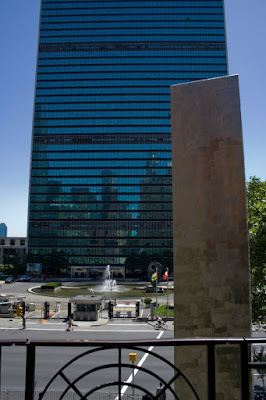 Luckily, there was a wall plaque and it read, "Permanent Mission of India to the United Nations". We are, after all, heading straight for the United Nations. 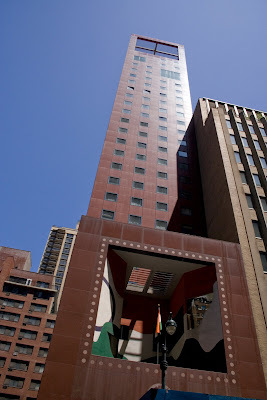 Designed by Charles Correa, a leading architect of India, the building that houses the Permanent Mission of India [PMI] has a striking personality and embodies the cultural iconography of t he country its represents. The red granite base is vividly contrasted by a grand monolithic entryway in handcrafted bronze. The granite is broken by an audacious square opening high above the entrance that has a stylized version of the Indian national flag. At the top of the building is a double-height penthouse porch, which echoes an Indian barasati. The entire structure symbolizes the timeless richness of Indian architectural forms. Wondering what a barasati is? From Indianexpress.com: "Barsati, in general parlance, and chaubara in typical Haryanvi meant a one-room penthouse — considered to be a romantic structure. They were airy and located at a height to make you actually feel 'on top of the world.' The importance of a barsati or a chaubara could be known and felt only during mild showers or torrential rains. These country dwellings filled the heart with awe and enjoyment." And here is Galinsky, a site that offers " free access to exciting modern buildings and the means to explore them: photographs, descriptions and practical visitor information." This is their short article on the Indian Mission. 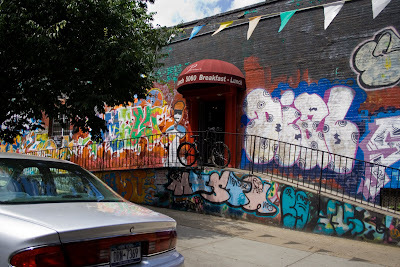 Tomorrow I will tell you what restaurant this is. Tonight I must sleep. 7/24 - Did you already know? Behind that grimy exterior is the great Sushi Yasuda. 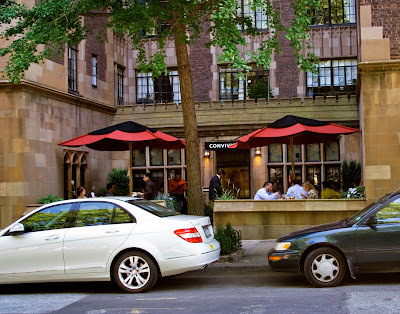 The New York Times has given it 3 stars and Zagat declares it New York's best Japanese restaurant, with a food rating of 28 (one more than that of the exalted Masa, the most expensive restaurant in the city). I haven't been to either but I have my dreams. Here's another photograph of tall buildings towering over a small one. I mean, a group of small ones. And, in fact, it's the same tall white building that was towering over St. Agnes from two nights ago. Although now I see, it's light brown in the front. Somehow it gives off whiteness. 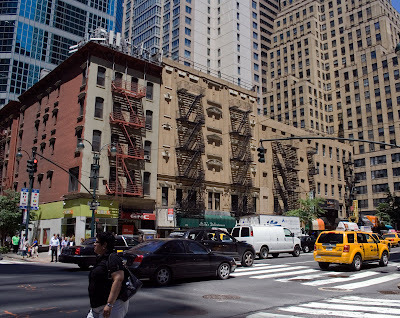 And here is the street level view of this block of tenements – from 43rd Street to 44th. Long may they stand! 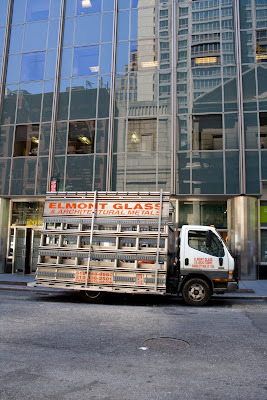 Just as the Caliente cab belongs in front of the Caliente Cab Co. Mexican Restaurant, the Elmont Glass and Architectural Metals truck belongs in front of this building. 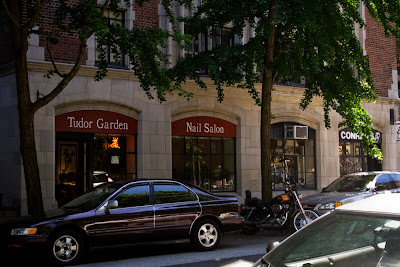 Last Wednesday, I was through with therapy at 11:45 (location, Upper West Side) and I was to meet FL for lunch on Tudor City Place at 2:15. That gave me enough time to do a photowalk and get a pedicure. I took the 1 train downtown, and the 7 across to Grand Central. I wanted to walk 43rd Street from Lexington Avenue to First Avenue where it ends, and Tudor City Place in its entirety, from 43rd to 40th Street. Midtown from noon to 1:00 is madness, with zillions of office workers out looking for lunch, and in a hurry. However, when I turned off Lexington onto 43rd Street, I was struck with . . . quietness. Yes, right there in middest midtown. Just steps from Grand Central. For some reason, there was no place to get food, so no reason to be there. 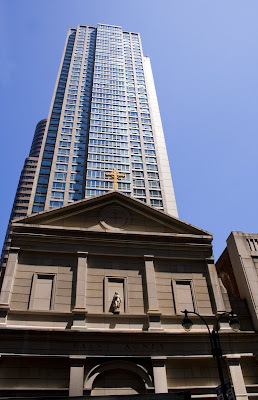 There was also not much to photograph, until I saw Saint Agnes Church being dominated by a tall severe white building. 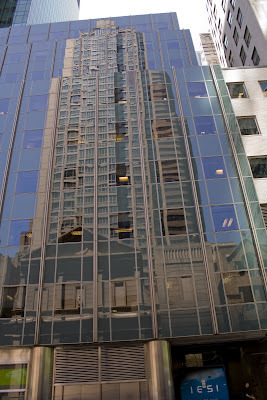 And the scene being reflected across the street. Here we are at the Fat Cat. We whispered the password and slipped in. But first a look across the street. Here at Sam's Fetish, the most prominent item is a pair of horizontally striped knee socks. To each his own, fetish-wise. 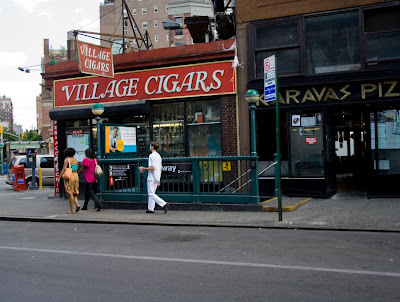 And here's our old friend landmark Village Cigars. As for ping pong, let me just say I improved over the four games we played. I lost the last game 21-7. Look out, Myra! 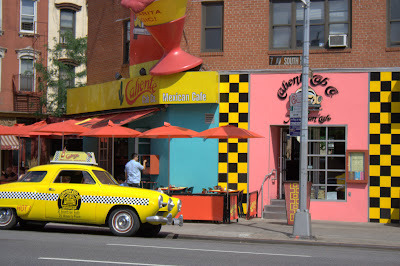 Caliente Cab Co. seems to be overwhelmingly disdained for its mediochre overpriced food, but it's so cute and the location is so good, and there're so many people in the world who haven't yet been there, that it stays in business. How long has it stayed in business? Since 1984. I was here soon after it opened. Everyone has to go once. Your turn. I like it when I can get one short block with its low buildings all in one clump. I feel like I can just grab it all up in one piece. Yesterday I went downtown to meet Myra to play ping pong. She's been playing at the Fat Cat and talking it up so I took her up on it. On the way I picked up a few shots. 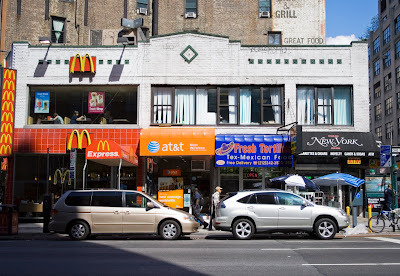 I got off the subway at Houston and walked up Seventh Avenue South. Or so I thought. I just now discovered that this is Varick Street and not Seventh Avenue South. 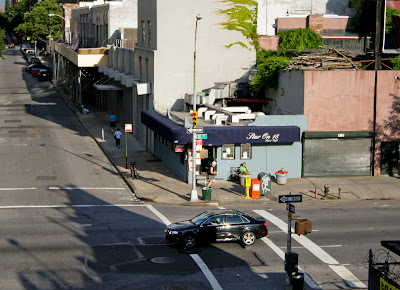 Seventh Avenue South starts one block north of Houston at Clarkson Street, a little bitty 4-block long street, or, if you prefer, Carmine Street (on the other side), a two block long street. Not Houston Street, which goes all the way across Manhattan. It's not right. When we last saw this building, it was vacant and looked like this. 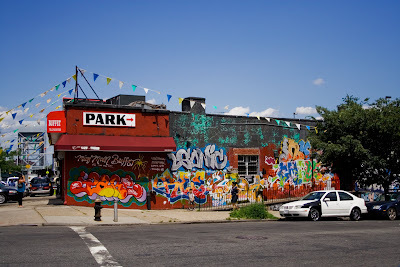 I don't have a photograph to commemorate its state when it gained a new tenant, the Ming Moon Buffet, and as a result (I assume), the wall art was painted over in a brutal and sloppy way. But now they have come to their senses, and we have this new ambitious and vibrant addition to the street. We've come to the end of this walk. I'm shooting through the gate that closes off the next section, which goes to 30th Street. It's supposed to be ready next year. You know Bill Cunningham who does the "On the Street" section in the New York Times? You know, where he notices something in fashion and shoots many examples of it – like hats or everybody's wearing black and white? Well, he went to the High Line and took a lot of shots and has this wonderful commentary. You need to watch it. It'll make you happy. I think this is my favorite photograph from up here. 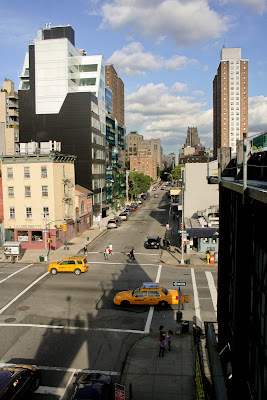 One of the pleasures of being on the High Line is getting a different view of things. 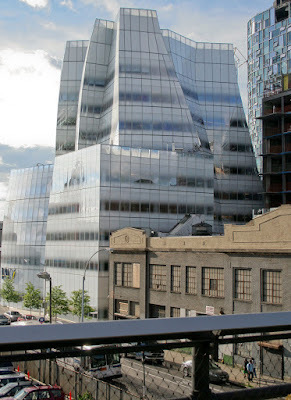 This is the Gehry designed office building for IAC, about which you will hear more when I get there. We're on the outside looking into a sort of amphitheater in which people can sit and gaze out at the . . . traffic. Pretty funny. Don't worry about the little girl who seems about to tumble over the edge. A thick pane of glass is holding her in. Tonight my internet connection is back and so I can once again post. Do you notice how calm I am? Yes, I am calm even though I lost not only the internet, but my phone. The DSL folks sent out a DSL technician today who restored my vital connections and told me it all happened because of the rain. Meanwhile, my TV (cable) is doing fine. I'm just sayin . . .
LeWitt's pieces are executed by people other than himself because they have only to follow his directions to give form to his concept. Finch had the idea of taking a photograph of the surface of the Hudson River every minute for 700 consecutive minutes, then extracting one pixel from each photo, reproducing them on color film and then laminating the film on 700 panes of glass. If this interests you, Art In America has a pretty good critical piece on it. 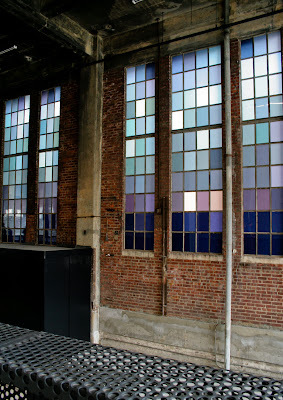 Inspired by the light and the water of the Hudson River, The River that Flows Both Ways will transform an existing series of windows with 700 individually crafted panes of glass representing the water conditions on the Hudson River over a period of 700 minutes on a single day. 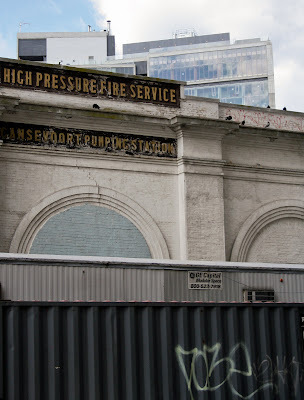 The installation will be placed in a semi-enclosed former loading dock where the High Line runs through the Chelsea Market building, between 15th and 16th Streets, viewable from the street and on the High Line. The work links the movement of the river, viewable from the site, with the historic movement of the railway and the atmospheric conditions of its location on Manhattan’s West Side. The piece, with its varied levels of color, translucency, and reflectivity, addresses the impossible search for the color of water. 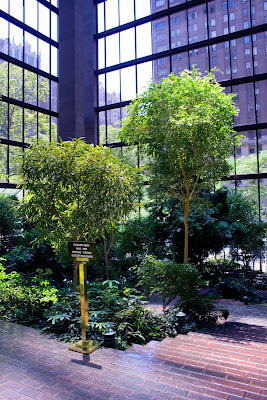 The title of this work comes from the original Native American word for the Hudson River, Muhheakantuck, which means “the river that flows both ways.” This flow in two directions is analogous to the way both water and glass work optically, as both windows and mirrors, allowing a view into depth as well as a reflection of the surrounding environment. 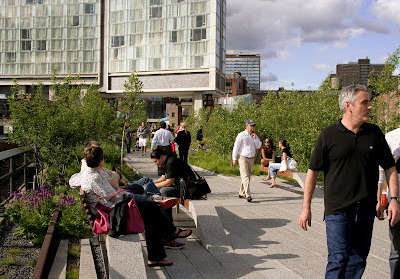 I realize that I've been talking about the High Line as though everyone knows what it is, but it's entirely possible you don't know even if you live in New York. So let's start at the beginning. In the beginning, say 1851, a railroad ran on the streets of New York, creating such peril for street traffic that 10th Avenue came to be nicknamed Death Avenue. And so it came to be that in 1929 (before or after the crash?) the City and State of New York and the New York Central Railroad agreed to the West Side Improvement Project, which included the High Line and added 32 acres to Riverside Park. 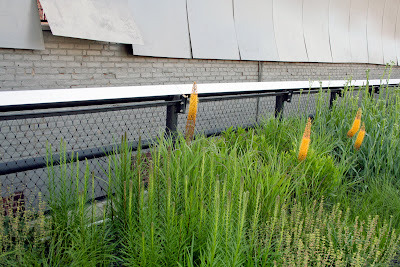 The High Line ran from 34th Street to Spring Street and was designed to go down the center of blocks rather than over the avenue to keep things tidy. Imagine. It ran through factories and warehouses and so could pick up and deliver freight without setting foot in the street. And we think we're so smart. But, alas, the feds built the interstates in the 50's and trucking became competitive with freight trains, causing a drop in rail traffic. In 1980 the last train ran on the High Line carrying three cars of frozen turkeys. What an ignominious end. The High Line was abandoned and as the months and years went by, nature took over. Wild grasses grew, and flowers. It was becoming a meadow. A few people noticed. They probably snuck up there. They thought it was way cool. Wow, this would make an awesome park, they probably said to themselves. 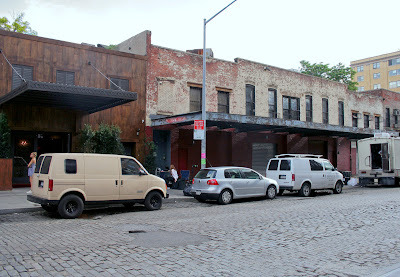 Oh, I forgot to say that in the 60's the southern part was demolished, whether all the way to Gansevoort or not, I don't know. 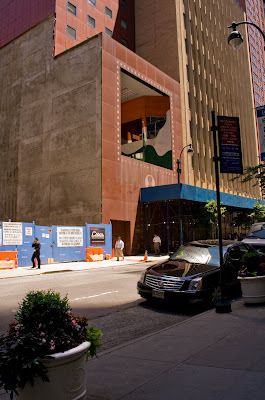 So then some people wanted it torn down, including Mayor Guiliani, and others fought to keep it. Friends of the High Line was formed. Friends of the High Line won. A miracle. 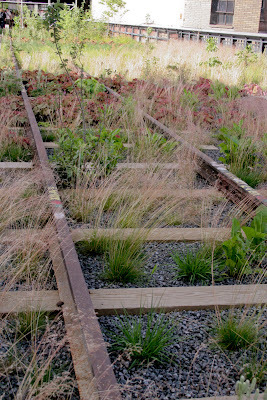 The photos above show how the landscaping keeps elements of the High Line's abandonment period. 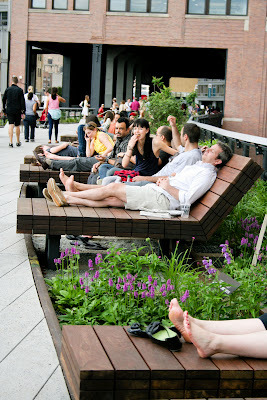 We're up in the High Line now and everyone looks right at home. I was reminded of my cats when I saw these people on the benches. It's like when a box is delivered to me and it's there on the floor, they take one look and jump on it and settle down. Nice, a new place to lie on, they say to themselves. I was going to go into the story of the High Line tonight, but if you'll look at what time it is, you'll understand when I say I'm just going to recommend you go to the High Line Images and Video website. It has historical photos showing trains running in the street before the High Line was built, and it shows it being built and then being used. Then there are contemporary photographs showing it overgrown with grasses and wild flowers. And more. Well worth taking a look. I'll have more to say tomorrow. For now, I still have to put sheets on my bed. Okay, back to the High Line. 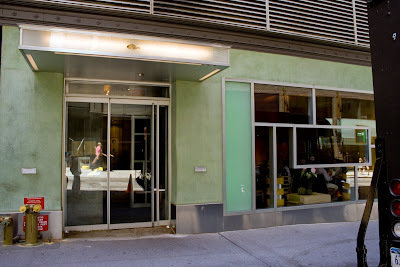 This is the entrance at Gansevoort Street. 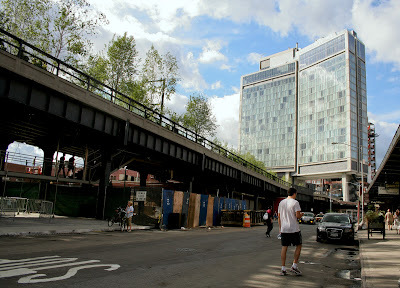 Wait, but first, before getting into the High Line, let's consider The Standard – that gorgeous building looming ahead. You've already seen a long shot of it 3 nights ago. If you're interested in new architecture, I have some links for you. The New York Times's Nicolai Ouroussouf calls it serious architecture. 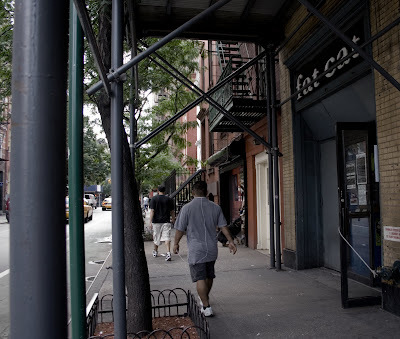 New York Magazine makes a case for The Standard's "interpreting the spirit" of the Meatpacking District, and then on the next page, you can read an account of what it's like to stay there. Did I forget to mention it's a hotel? 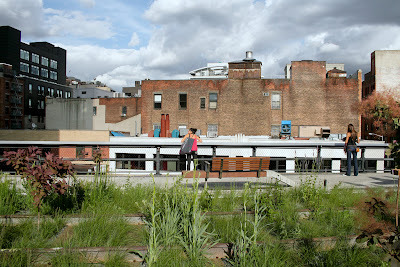 Last, go here for a web cam shot that shows it in relation to the High Line, looking down on the High Line. You can also play with their 360° speeded up video. 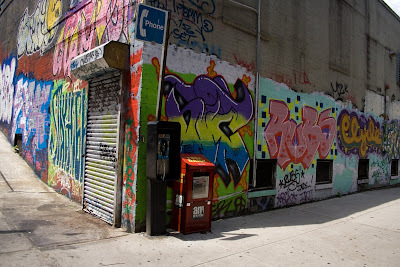 These three shots are of the north side of this block, which is awaiting construction of a branch of the Whitney Museum. 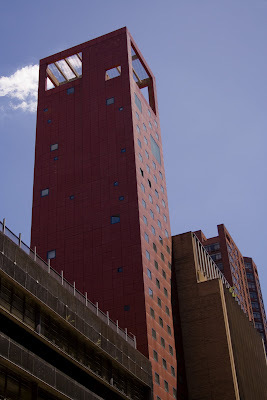 The design is by noted architect Renzo Piano. It will be impressive. In the meantime, this is what is here, with its own charm. Go to the New York Times to read a mostly approving article by architecture critic Nicolai Ouroussoff. 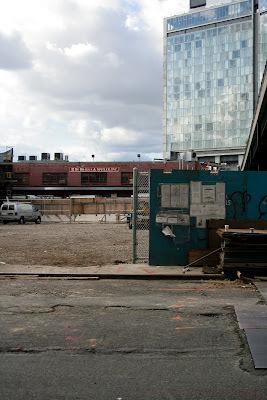 Here's the last block of Gansevoort Street with New Jersey in the distance. Awfully close, isn't it? As I walked to the end of the block, I was surprised to find there were some interesting shots to be had. Well, not that surprised. 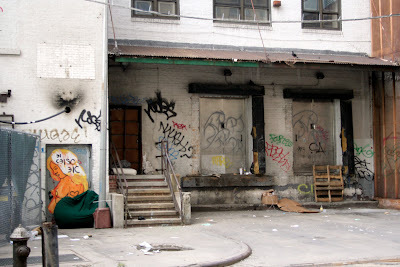 But for now, I want to announce the Third Anniversary of The Manhattan Street Project. Yayy! Let's all have champagne. Or prosecco. Below are two maps; one is from July 3, 2006 and the second was shot today. I don't even know how to guess how much I've done, but any fool can see there's way more to do. But I'm up for it; it gives me a reason to go on living, after all. The reason the first map comes with streets already marked is that I had started the project before I started the blog. However, I've been rewalking those pre-blog streets because, as my obsession grows, I realize that they MUST be photographed. 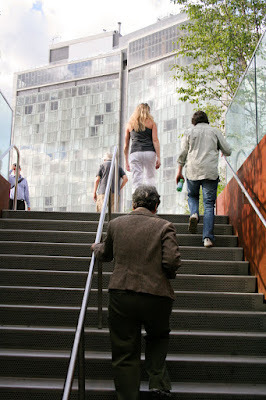 Here we are at our destination – the High Line. And there's Myra. Out of the frame. 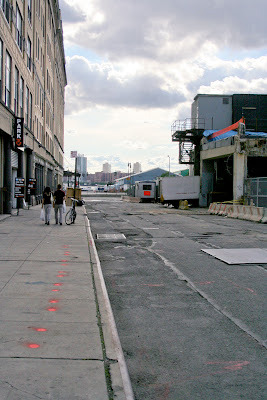 But first I want to finish Gansevoort Street – there's only one more block to go. We all need a rest anyway after last night's discursive entry. 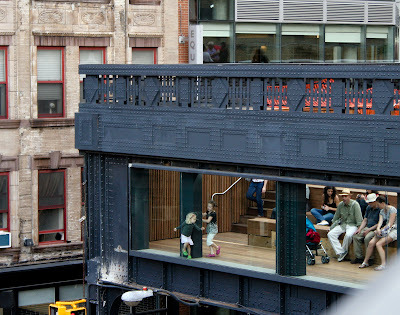 We'll have plenty of time to talk about the High Line and that fabulous building straddling it. 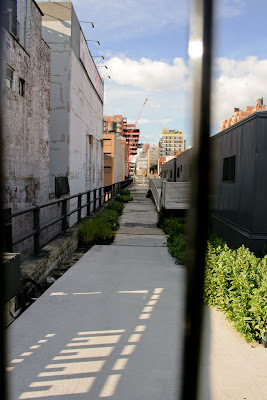 The street view in Google Maps shows the High Line before it was worked on. My apologies for the non-post last night, an historic first for this blog. (Not counting vacations, of course.) I was just congratulating myself on that the other day. In almost three years, I've never missed a daily post, I said to Barbara. I'm impressed with myself, I said. See what happens when you say something like that out loud? Last night I came home late, maybe just a touch looped, and realized this wasn't going to be like those other nights when I've come home late and just a touch looped, because tonight I needed to research the Meatpacking District and then write a coherent couple of paragraphs. Furthermore, it couldn't be put off because this was the only photo of historic buildings on this walk. Realizing all this took the last bit of brainpower I had left, so I said to myself, I'll just take a little nap and do this later. When I awoke at 10 a.m. this morning, it was clear that I couldn't call this last night. Nos. 54-56, the middle two of the building at the right, began life around 1850-54 as a carpenter shop and stable, and nos. 52 and 58 on the ends, were constructed as tenements in 1853. Yes, tenements are generally (always?) 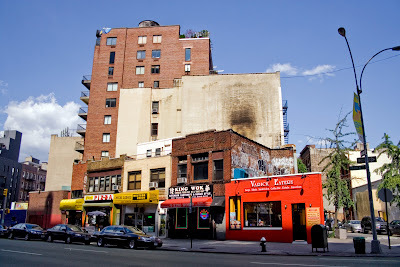 more than two stories, and these tenements were originally 3 and 4 stories tall. The carpenter shop and stable were operated by one family, William Hoe, his son James Hoe, and James's sons, William and George, from the beginning in 1853 until the company went bankrupt in 1933. In 1937, during the "last major phase of development of the district," according to the report, when new low rise buildings were built and other buildings altered and reduced in height for market uses, these buildings were reduced to two stories and connected to form a market building, with upstairs offices. The first tenants dealt in wholesale fruit and produce. In 1963, Ottman & Co. expanded its wholesale meat business into this space and the name is still visible on the end of the metal awning, but I can't find any evidence of the company's existence today. The report concludes that this building contributes to the District, not only because of its market use, but because its brick and stone façade and metal canopy contributes to the visual cohesion of the district.